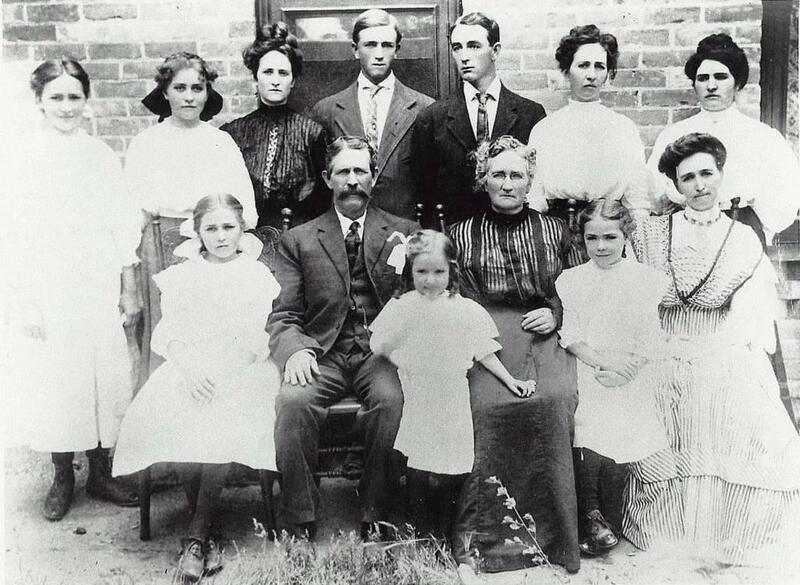 Comments: Blanche Lapreal Brough (Nee: Bigler) | Nephi UT United States | 1901-1920 | Comments: This photograoh of the Abner Chase Bigler family was taken on July 18, 1908 after the funeral of their twelve year old son, Clarence Gean Bigler, who was killed after being crushed by a loaded hay wagon. Front row (left to right): Florence (Clarence's twin), Abner Chase Bigler (1854-1930), Leila, Elizabeth Anderson Tranter Bigler (1858-1034), Blanche, and Amy. Back row: Nina, Vera, Lillie, Erin, Abner, Sadie, and Itha. This photograph is from the collection of the late Franklin Keith Brough.